M.A.C. Senior Artist John Stapleton. Photos courtesy of M.A.C. Ala Moana Center is home to one of the nation’s very few M.A.C. Pro Stores. That means that our local M.A.C. store carries 100 percent of the M.A.C. line of products, even the ones that are otherwise exclusive to Japan or other locales. It also means that we often get visits from M.A.C. celeb artists such as John Stapleton of L.A. 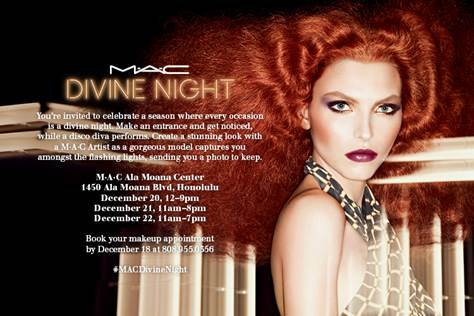 I recently interviewed John when he was at Ala Moana for M.A.C.’s “Divine Night” show at Ala Moana’s Center Stage. John oversees many of the designer fashion shows for which M.A.C. creates makeup in NYC and Europe. This gives him a front row seat for spotting makeup trends hot off the runways. “Makeup trends start on the runways of (for example) Chanel and Blumarine,” John said backstage as the buffed male models were getting a high sheen on their naked torsos. Trends also start in Hollywood, so it behooves John to be living in L.A. “We (M.A.C.) are at the forefront of helping mold the trends,” John said. He said everyone, from textile designers to fashion designers to makeup artists, is “Working with the same palettes. We all have enough lead time to develop a story” with color, texture and technology. “Expect to see less sculpting and more highlighting,” John explained. It’s not about contouring, a word he avoids; it’s about highlighting. He said one of the biggest mistakes he sees women making is “People use the wrong colors for shading. For example they’ll use a bronzer for contouring but they should be using a brown with a blue base. Due to our humidity, Hawaii has a great advantage over most climates when it comes to the dewy, opalescent look. It’s all about lush, hydrated skin “So don’t fight the atmosphere,” John said. Our climate also screams for color that vibrates, such as coral and fuchsia. “These are great with olive skin tones, which many Hawaii women have,” John explained. “I also want to see lots of orchid lipsticks. They’re one of my go-to’s for celebs such as Kelly Osbourne. I always put it on her. Purples are always a huge hit at M.A.C.” And, he said, they have a purple for every woman. M.A.C. brush #224 for blending. 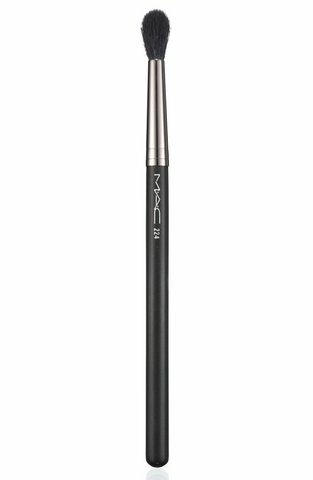 John surprised me when he said he believes women really only need two makeup brushes: one that’s firm and dense, with a round tip to pick up color and apply it; a second that’s softer and wispier with a pointed end to use for blending. I’m going to try that. It will certainly simplify my life, especially when travelling! M.A.C. 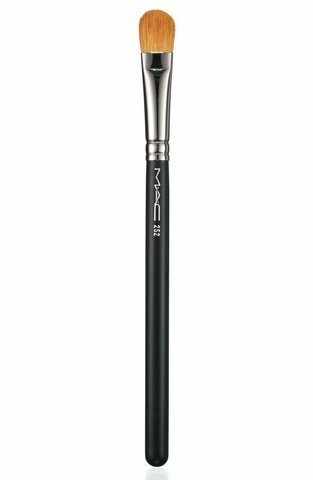 brush #252 for applying color. Since lip gloss can ruin the look by bleeding out over everything, John suggested trying an opalescent cream lipstick just on the bow of the lips to catch the light. Asked whether he recommends powder or cream blush, John said it depends on your skin: “If you’re not exfoliating enough, use a cream blush.” Powder blush can make the skin look drier and the unevenness more obvious. The 2014 trends are perfect for Hawaii, so let’s feel free to experiment and play with them. What’s the big deal? It all washes off, right?